Below is a complete list of open clinical trials at the Weill Cornell Breast Center. Click on the study name to read detailed information about the study. To find out more about our clinical trials or to make an appointment at the Breast Center, please call (212) 821-0644. Glutamine Study Reducing peripheral neuropathy using glutamine -Grade 1 or above neuropathy-During or after Taxol or Abraxane. GALENA A vaccine trial: evaluating NeuVax in preventing breast cancer recurrence. -HER2 1+/2+, node positive-Completed standard treatment with surgery, chemo, radiation. SYNTA Using Ganetespib, a small molecule inhibitor against Hsp90 protein, to stop tumor growth -Previously untreated metastatic, HER2 positive, or TNBC*. TM Using TM (copper depletion) to prevent recurrence in moderate to high risk patients -Metastatic no active disease-Stage 2 and above TNBC*. The Weill Cornell Breast Center has recently opened a new clinical trial for women with locally recurrent or metastatic breast cancer that was previously treated with anthracycline, a taxane, and capecitabine. The study sponsor is Nektar Therapeutics. The principal investigator at Weill Cornell is Dr. Tessa Cigler. For more information about the study, please call Marta Cobham, RN at (212) 821-0780 or e-mail Marta at mac2034@med.cornell.edu. The purpose of the study is to test how well women with breast cancer respond to treatment with the experimental drug NKTR-102, compared to standard treatments for breast cancer. The study will also look at the side effects of the study drug and examine how long NKTR-102 stays in a patient’s blood. Arm A: participants will receive NKTR-102 via infusion on Day 1 of each 21 day cycle. Arm B: participants will receive one of seven standard of care treatment options available at the study center. The choice of treatment in Arm B will be made after discussions with your doctor. Depending on which drug is chosen by you and your doctor, cycles in Arm B will be either 21 days or 28 days. The study will take about 38 months to complete. The amount of time on study depends on how well a participant responds to study treatment. 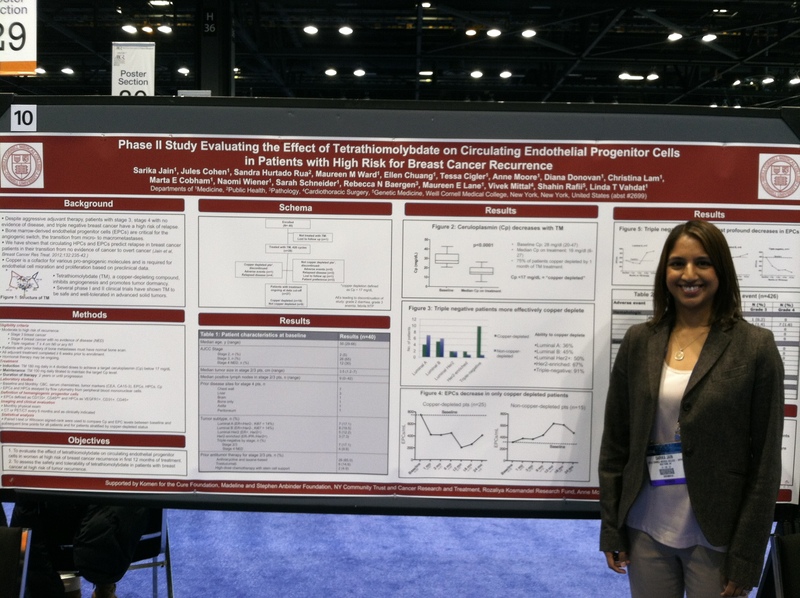 Dr Sarika Jain, a 3rd year Hematology Fellow at Weill Cornell Medical College, presented data on one of the Breast Center’s studies at the recent American Association for Cancer Research (AACR) meeting. The study presented was a Phase 2 trial of Tetrathiomolybdate in women with breast cancer at high risk of relapsing. The purpose of this study was to try to keep breast cancer cells in a dormant state by depleting copper, an essential component to helping these cells come out of dormancy. The study data shows that the researchers were able to copper deplete patients safely with few side effects, and they were able to drive down the cells we believe are critical to facilitating metastases. Click here to read the abstract of the presentation.